Tuberculosis remains a serious world-wide health threat which requires the characterisation of novel drug targets for the development of future antimycobacterials. One of the key obstacles in the definition of new targets is the large variety of metabolic alterations that occur between cells in the active growth and chronic/dormant phases of tuberculosis. The ideal biochemical target should be active in both growth phases. 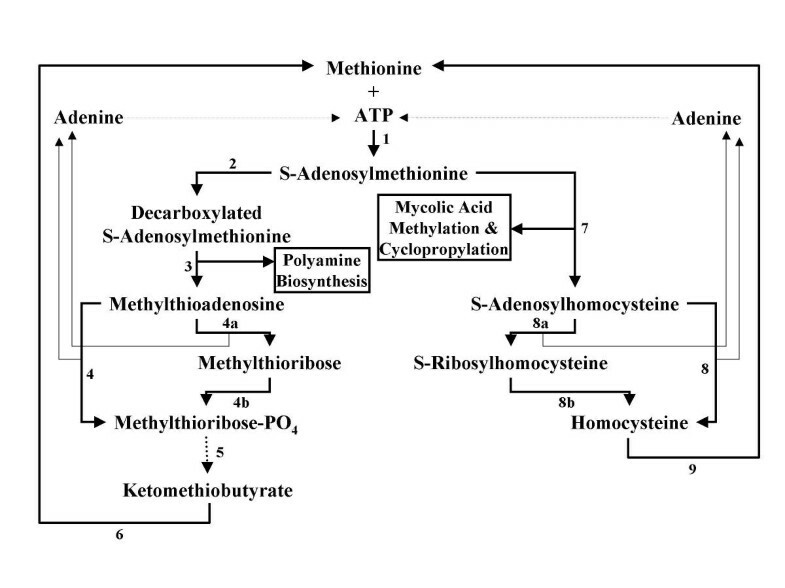 Methionine adenosyltransferase, which catalyses the formation of S-adenosylmethionine from methionine and ATP, is involved in polyamine biosynthesis during active growth and is also required for the methylation and cyclopropylation of mycolipids necessary for survival in the chronic phase. The gene encoding methionine adenosyltransferase has been cloned from Mycobacterium tuberculosis and the model organism M. smegmatis. Both enzymes retained all amino acids known to be involved in catalysing the reaction. While the M. smegmatis enzyme could be functionally expressed, the M. tuberculosis homologue was insoluble and inactive under a large variety of expression conditions. For the M. smegmatis enzyme, the Vmax for S-adenosylmethionine formation was 1.30 μmol/min/mg protein and the Km for methionine and ATP was 288 μM and 76 μM respectively. In addition, the enzyme was competitively inhibited by 8-azaguanine and azathioprine with a Ki of 4.7 mM and 3.7 mM respectively. Azathioprine inhibited the in vitro growth of M. smegmatis with a minimal inhibitory concentration (MIC) of 500 μM, while the MIC for 8-azaguanine was >1.0 mM. The methionine adenosyltransferase from both organisms had a primary structure very similar those previously characterised in other prokaryotic and eukaryotic organisms. The kinetic properties of the M. smegmatis enzyme were also similar to known prokaryotic methionine adenosyltransferases. Inhibition of the enzyme by 8-azaguanine and azathioprine provides a starting point for the synthesis of higher affinity purine-based inhibitors. Tuberculosis represents one of the world's greatest sources of mortality and morbidity, with approximately 8 million new infections and 2 million deaths per year . The situation regarding the control of tuberculosis has significantly worsened over the last decade, with the spread of strains resistant to multiple antimycobacterial agents. There is a profound need for the identification and development of novel chemotherapeutic compounds against tuberculosis. The characterisation of mycobacterial biochemical pathways aids this process through the identification of enzymes amenable to therapeutic inhibition. Mycobacterium tuberculosis is difficult to kill for a number of reasons. The organism is surrounded by a dense waxy coat consisting of unusual long-chain fatty acids (mycolipids) with hydroxyl, methyl, and cyclopropyl substitutions that prevent many common antibiotics from entering the cell . In addition, the organism normally resides in the unfused lysosome of macrophages, which further complicates access by antibiotics. Finally, the bacterium is able to enter a very slow-growing, chronic phase, where many biochemical targets are down-regulated . In this state, the bacteria shift their metabolic focus from sugars to β-oxidation of fatty acids, which entails a down-regulation of glycolysis and an up-regulation of the glyoxylate shunt . Therefore, in order to cure tuberculosis, an active compound must penetrate the macrophage, the bacterial coat, and be active against both the acute and chronic growth phases. For these reasons, antimycobacterial therapy relies on the combination of several drugs. In the examination of biochemical pathways in Mycobacterium tuberculosis, it would be ideal to identify processes where an enzyme plays a role in both active and chronic phase survival. In active, replicative growth cells require polyamines for cell division. While the exact function of these molecules is unknown, it is hypothesised that the positively charged spermidine and spermine act to stabilise DNA during unwinding and strand separation . In mycobacteria, polyamines may also play a role in transcriptional regulation , and have also been targeted for chemotherapeutic intervention [7, 8]. In the biosynthesis of polyamines, decarboxylated S-adenosylmethionine acts as an aminopropyl donor for the formation of spermidine from putrescine, and of spermine from spermidine (Figure 1). These reactions give rise to methylthioadenosine, which can be recycled back to adenine and methionine for further synthesis of S-adenosylmethionine (SAM). S-Adenosylmethionine as a common biochemical substrate for the rapid and chronic growth stages of M. tuberculosis . The pathways of S-adenosylmethionine usage and the potential recycling routes of methionine and ATP are shown. The enzymes which catalyse the reactions are: 1 methionine adenosyltransferase, 2 S-adenosylmethionine decarboxylase, 3 spermidine/spermine aminopropyltransferase, 4 methylthioadenosine phosphorylase, 4a methylthioadenosine nucleosidase, 4b methylthioribose kinase, 5 four steps not shown, 6 aminotransferase, 7 mycolic acid methyltransferases, 8 S-adenosylhomocysteine hydrolase, 8a S-adenosylhomocysteine nucleosidase, 8b S-ribosylhomocysteine hydrolase, and 9 methionine synthetase. It has not yet been determined in M. tuberculosis whether enzyme 4 or 4a/4b, and 8 or 8a/8b catalyses the recycling of methionine. The exact aminotransferase catalysing step 6 has also not been elucidated. Several studies have shown that mycolipid biosynthesis is essential for survival of M. tuberculosis in the chronic growth phase [9, 10]. Tuberculosis has been found to contain numerous genes encoding methyltransferases which methylate and cyclopropylate mycolic acids [11, 12]. The methyltransferases use S-adenosylmethionine as a substrate, yielding S-adenosylhomocysteine as a byproduct for recycling (Figure 1). In a recent study, deletion of the pcaA gene, which is involved in cyclopropane formation in mycolic acids, led to an inability of M. tuberculosis to persist within and kill mice . The mutant bacteria were able to grow normally and establish an infection, but were progressively eliminated from the spleen. Therefore, mycolic acid biosynthesis provides an attractive target for the persistent stage of tuberculosis. In the convergence of these active and chronic growth requirements is the enzyme methionine adenosyltransferase (MAT; also known as S-adenosylmethionine synthetase), which converts methionine and ATP to S-adenosylmethionine. Effective inhibition of this enzyme could then impact both growth phases of the organism. In this study, we have identified, cloned, functionally expressed, and characterised the methionine adenosyltransferase from the model organism M. smegmatis. In addition, the M. tuberculosis homologue has been cloned. Several prototypic inhibitors have been examined against the recombinant M. smegmatis enzyme. The complete, published genome for Mycobacterium tuberculosis H37Rv contains a single gene with very high homology to a variety of bacterial and eukaryotic MAT . The gene, designated Rv1392 is listed as a putative MAT, but has not yet been cloned, expressed, or characterised. The more recent complete, published genome for M. tuberculosis CDC1551 contains an identical gene designated MT1437 . The function of this gene has likewise not been validated. Similarly, there are no published reports on the characterisation of MAT activity in any mycobacterial system. Through examination of the complete, published genome of M. leprae , and the on-going genome projects for M. bovis, M. smegmatis, M. avium, and M. marinum it was possible to discover a single gene in each organism with a very high identity to Rv1392. Together with all other published MAT sequences available from the Entrez database http://www.ncbi.nlm.nih.gov/entrez/query.fcgi?db=Protein, the putative mycobacterial MAT were aligned and a cladogram constructed using the Neighbor joining method  (Figure 2). The relationship of the mycobacterial sequences mimicked the phylogeny of the organisms as determined by their rRNA gene sequences (data not shown). The M. tuberculosis and M. bovis MAT sequences were identical and closely related to M. marinum (95%). The M. tuberculosis sequence was then more distantly related to M. leprae (91%), M. avium (92%), and M. smegmatis (87%). As a group, the mycobacterial enzymes clustered with MAT from Streptomyces spp. (72–73% identical), and Corynebacterium glutamicum (66%), and had a more distant relationship with Aquifex aeolicus (42%), Thermotoga maritima (63%), and the low G+C content Gram-positive bacteria (38–58%). The M. tuberculosis MAT sequence was 49% identical to that from E. coli, 50% to Saccharomyces cerevisiae, 46% to Plasmodium falciparum, 49% to Arabidopsis thaliana, and 47% to Homo sapiens. 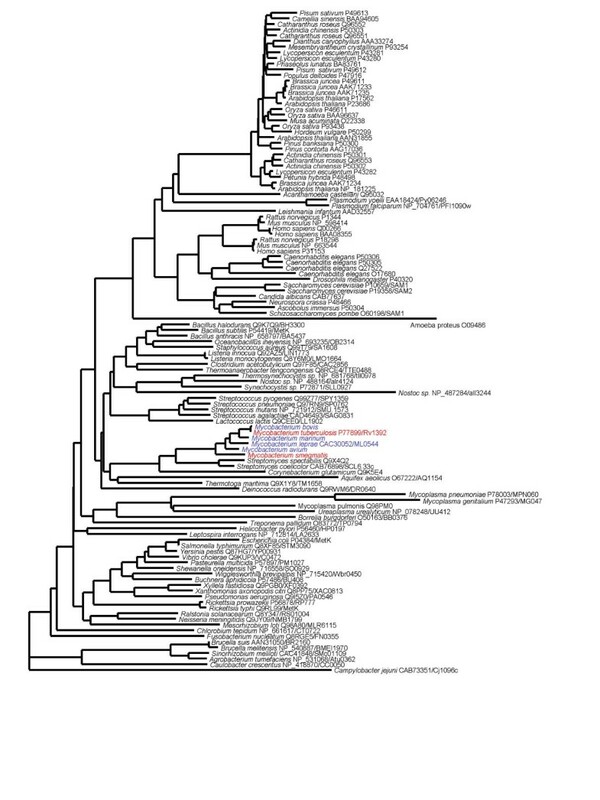 Phylogenetic relationship of methionine adenosyltransferase sequences. The enzyme sequences are labelled with Entrez accession numbers and, in the case of microbial genome data, with the protein identifier from the genome project. All sequences were aligned with the Clustal algorithm and used for tree construction using the neighbor-joining method. The sequences from M. tuberculosis and M. smegmatis are in red, while the other mycobacterial sequences are in blue. The high level of sequence identity seen between the M. tuberculosis MAT sequence and those from widely divergent organisms was consistent with the high degree of sequence conservation found across all MAT. In Figure 3, an alignment of selected MAT sequences is shown, along with annotation relating to the alignment of all the sequences shown in Figure 1. As can be seen with the ten sequences in Figure 3, there was high identity across bacterial and eukaryotic MAT. There were thirteen residues conserved across all 117 sequences used for Figure 2, but this value increased to 55 residues when the threshold is dropped to 98% conservation in order to allow for sequencing errors in genome data. All of the mycobacterial MAT sequences were found to retain the residues implicated in substrate and cofactor binding in the E. coli MAT crystal structure . D31(D17) and D309(D272) are the Mg2+ cofactor binding sites, while E57(E43) is the K+ cofactor binding site. D147(D119) and D276(239) interact with the methionine substrate, and G297(G260) through D304(D267) form the P-loop motif that make up the binding site for the ATP substrate . The residue numbers represent the position in the alignment shown in Figure 3. The numbers in parentheses represent the corresponding residues in the E. coli MAT, which has been structurally determined by X-ray crystallography . MAT is known from the E. coli structural model to form pairs of homodimers where the substrate binding sites are made up of the appropriate interface residues from each monomer . Based on the close primary sequence identity to the E. coli MAT, the mycobacterial enzymes would be expected to have a very similar spatial arrangement. Alignment of selected methionine adenosyltransferase sequences. The following sequences were aligned with the Clustal algorithm: Mt, M. tuberculosis; Ms, M. smegmatis; Mb, M. bovis; Mm, M. marinum; Ml, M. leprae; Ma, M. avium; Bs, Bacillus subtilis ; Ec, Escherichia coli MetK , Sc, Saccharomyces cerevisiae SAM1 ; Hs, Homo sapiens MAT1 . Residues conserved by 75% of these sequences are boxed. The annotation below refers to 100% (#) or 98% (+) conservation of residues by the 117 sequences in Figure 2. Residues marked with M are the putative Mg2+ binding sites, K the putative K+ binding sites, A the ATP-binding residues of the P-loop, and X the residues that interact with the methionine substrate. The putative gene encoding MAT was cloned from both M. tuberculosis H37Rv and from M. smegmatis NCTC-8159. The sequences were then initially subcloned into pCALnFLAG in order to make N-terminal calmodulin-binding peptide fusion proteins. The enzymes were expressed in E. coli BL21 CodonPlus RIL cells under the conditions outlined in the Methods section. The M. tuberculosis MAT was found to express completely as insoluble, inactive inclusion bodies, whereas the M. smegmatis enzyme yielded primarily inactive inclusions with approximately 5% soluble, active enzyme. By scaling up the incubations, sufficient M. smegmatis MAT was obtained for further characterisation. In order to produce soluble, active M. tuberculosis MAT, a number of alternative methodologies were applied. The inclusion bodies were solubilised with 8 M urea and subjected to refolding by dialysis exactly as outlined in Lopez-Vara et al. . Inclusion bodies were also solubilised using N-laurylsarcosine at pH 11 and refolded as outlined in the Novagen refolding kit. 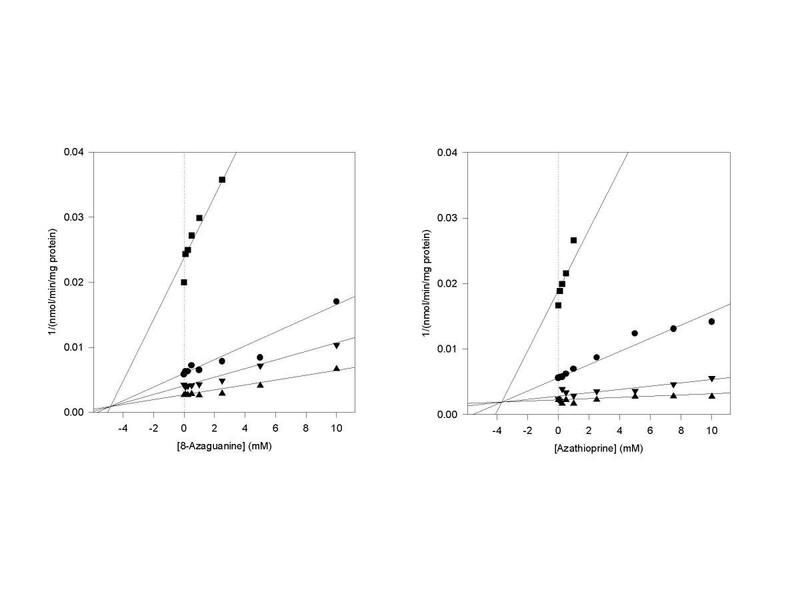 Expression of the protein was attempted at different temperatures, with different concentrations of IPTG, and for different lengths of time post-induction. Induction was performed on stationary phase cells. The pCALnFLAG construct was used in E. coli BL21(DE3)pLysS for more stringent regulation of induction , or in BL21(DE3)Origami which maintains a more oxidizing internal environment to allow for disulfide formation . The MAT sequence was fused to a decahistidine N-terminal tag or to an N-terminal fusion with the E. coli NusA protein which is reported to increase solubility . Finally, the tuberculosis enzyme was cloned into pWH1520 for expression in Bacillus megaterium under the xylose operon . None of these experiments yielded active MAT. However, solubilisation of inclusion bodies by N-laurylsarcosine as per the Novagen refolding kit did yield soluble enzyme under physiological conditions. Unfortunately, the micelles containing the enzyme were precipitated by the addition of Mg2+, preventing activation of the apoenzyme. In addition, fusion of the tuberculosis MAT to the E. coli NusA protein also resulted in large amounts of soluble protein. However, neither the fusion protein nor the enterokinase-liberated MAT had detectable activity. The basis for this lack of activity is not clear, but may be due to misfolding of the fusion protein. The M. smegmatis MAT was examined with variable concentrations of substrate and a fixed concentration of cosubstrate and cofactors in order to determine the kinetic constants for the enzyme (Figure 4). The Vmax for the enzyme was found to be 1.30 ± 0.40 μmol/min/mg protein and the Km was 288.47 ± 40.90 μM for methionine and 76.19 ± 13.53 μM for ATP. 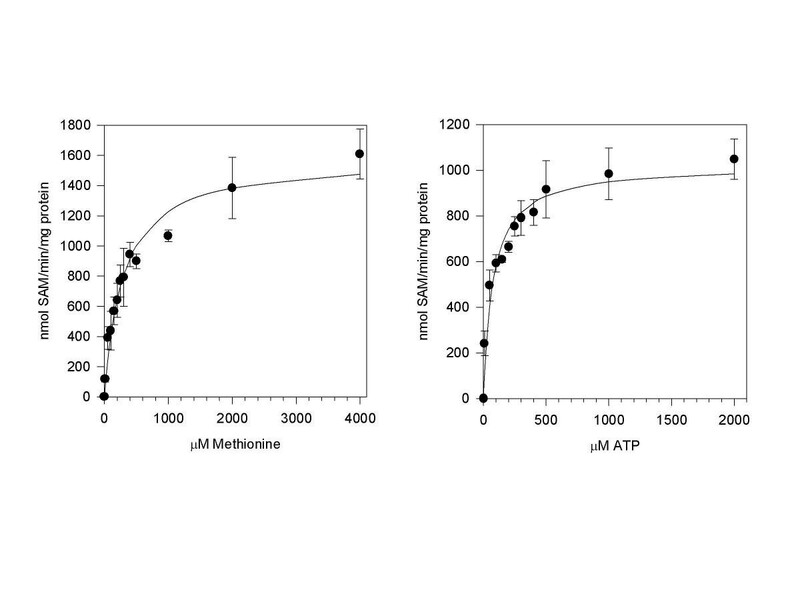 The calculated Kcat for the enzyme was 0.93 s-1, and the Kcat/Km was 12200 M-1s-1 for ATP and 3200 M-1s-1for methionine. Kinetic characterisation of M. smegmatis methionine adenosyltransferase. The enzyme was incubated with 0 – 4.0 mM substrate and 10 mM cosubstrate as described in the Methods section. The production of SAM was measured by HPLC, and the resulting data fitted to the Michaelis-Menton equation. In order to screen substrate analogues as potential inhibitors, commercially available test compounds were screened initially in 10-fold excess to the substrate concentration, without enzyme-inhibitor preincubation. Eleven methionine analogues (Table 1) and 33 purine analogues (Table 2) were screened in this manner. Of the methionine analogues, no compound inhibited the production of SAM by more than 25%. The best of these inhibitors, cycloleucine, is treated in the literature as a classic inhibitor of MAT activity, but typically acts weakly . Of the purine analogues, two compounds provided substantial inhibition of MAT activity: 8-azaguanine at 82% inhibition and azathioprine at 76%. These two compounds were then tested in detail in order to determine the inhibition constants (Figure 5). Both purine analogues yielded an inhibition pattern consistent with competitive inhibition, and 8-azaguanine was found to have a calculated Ki of 4.70 ± 0.77 mM and azathioprine one of 3.74 ± 1.00 mM. These Ki values are 49–62 times greater than the Km of the enzyme for ATP. Inhibition of methionine adenosyltransferase by 8-azaguanine and azathioprine. The M. smegmatis enzyme was incubated with 0–10 mM inhibitor, 10 mM methionine, and 0.5 (squares), 1.0 (circles), 2.0 (inverted triangles), or 3.0 (triangles) mM ATP as described in the Methods section. The data is shown as Dixon plots. The inhibition of methionine adenosyltransferase by methionine analogues. The M. smegmatis enzyme was incubated with 1 mM methionine, 10 mM ATP, 20 mM Mg2+, 150 mM K+, and 10 mM inhibitor, as described in the Methods section. The inhibition of methionine adenosyltransferase by purine analogues. The M. smegmatis enzyme was incubated with 1 mM ATP, 10 mM methionine, 20 mM Mg2+, 150 mM K+, and 10 mM inhibitor, as described in the Methods section. The two inhibitors were also tested for their ability to inhibit the in vitro growth of M. smegmatis in Middlebrook 7H9 medium. Azathioprine was found to have an MIC of 500 μM, while 8-azaguanine was unable top completely inhibit growth up to 1.0 mM. Both compounds had a marked effect on growth (at least 50% growth inhibition) down to 2.0 μM. S-Adenosylmethionine is one of the most important cellular biochemical cofactors, and plays a role in a large variety of essential metabolic pathways. The formation of SAM from methionine and ATP by MAT therefore represents a crucial checkpoint for numerous functions required for cell growth and division, such as polyamine biosynthesis and methylation reactions. Not surprisingly, MAT is a very highly conserved enzyme and displays a high sequence identity from bacteria through to humans. Even bacteria with known degenerate, minimal genomes, such as Mycoplasma spp. [24, 25], Buchnera aphidocola , and Mycobacterium leprae  contain a sequence with a high identity to MAT. The only exception to the ubiquity of MAT is the archaebacteria, which perform this enzymatic function with a highly divergent enzyme which shares only the active site residues with the E. coli MAT . It is not presently clear whether the archaeal enzymes represent convergent or divergent evolution, but the close identity within the bacterial/eukaryotic MAT would suggest that the archaeal enzyme is analogous. In mycobacteria, SAM plays an additional role beyond normal cellular methylation and aminopropylation reactions, as the organisms are reliant on the cofactor for the formation of methylated and cyclopropylated mycolic acids. These fatty acids are very long, and consist of 70–90 carbons  and contain methyl, hydroxyl, and cyclopropyl substitutions that are diagnostic for individual mycobacterial species . In M. tuberculosis, there are as many as seven SAM-dependent methyltransferases involved in mycolic acid methylation and cyclopropylation . Interference with cyclopropyl formation in mycolic acid synthesis has been shown to impact virulence, persistance, and resistance of M. tuberculosis to oxidative stress . When coupled with the role of SAM as an aminopropyl donor for polyamine biosynthesis during cell division , interference with SAM has the potential to impact both the active and persistent phases of tuberculosis. The obvious convergence of these biochemical pathways is the synthesis of SAM by MAT. In this paper, we have cloned the M. tuberculosis and M. smegmatis MAT, and have found that the sequences display a high degree of identity with other bacterial and eukaryotic MAT. Both organisms contain only one copy of MAT which are 87% identical. However, the 13% difference in primary sequence had a major impact on the functional expression of the enzymes. The M. smegmatis MAT expressed in E. coli primarily as inclusion bodies, although 5–20% of the enzyme could be recovered as soluble, active material depending on the length of time of induction. The M. tuberculosis MAT expressed in E. coli solely as inclusion bodies. A large number of experimental variations and refolding experiments were attempted, but active tuberculosis MAT could not be recovered. In two instances, the enzyme was obtained in soluble form under physiological conditions, but still retained a lack of activity. The solution to this difficulty is still under examination. The M. smegmatis MAT was characterised and found to have a Vmax of 1.30 μmol/min/mg protein, and a Km for methionine of 288 μM and for ATP of 76 μM. These values are interesting when compared to similar values found for other MAT. In general, the Km for methionine is lower than the Km for ATP. In a MAT purified from human lymphocytes, the Km was 31 μM for methionine and 84 μM for ATP , while in bovine brain the Km was 10 μM for methionine and 50 μM for ATP . In Leishmania infantum, the Km was 35 μM for methionine and 5 mM for ATP , whereas in Trypanosoma brucei brucei there were two isoforms detectable with Km values of 20 μM and 200 μM for methionine, and 53 μM and 1.75 mM for ATP . In E. coli, the these values were much more similar, with a Km of 80 μM for methionine and 110 μM for ATP . The M. smegmatis MAT is thus unusual in that the Km for ATP is significantly lower than that for methionine. 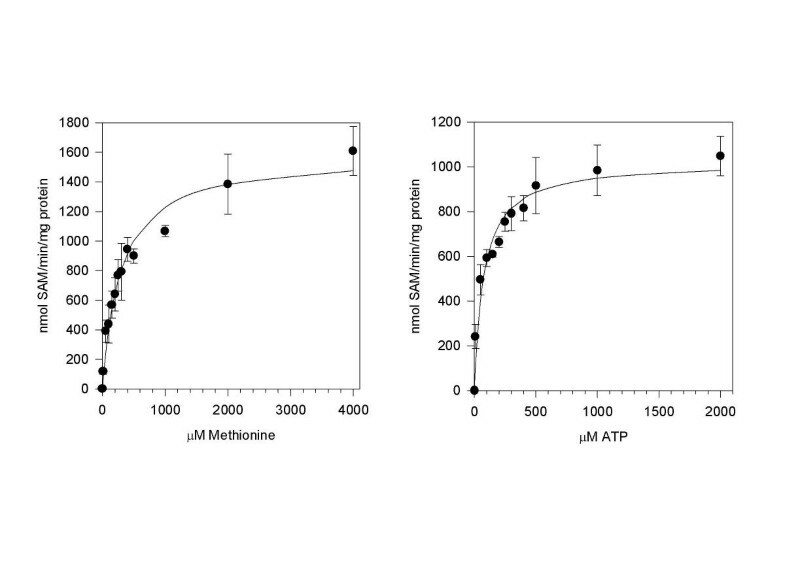 The molecular basis and implication of this difference in substrate affinity is unclear, but, in general, the Km values for the mycobacterial MAT are in the same range as in other characterised organisms. Aside from the Km value for methionine, the M. smegmatis MAT appeared to closely resemble the E. coli enzyme. In E. coli, the Vmax was found to be 2.2 μmol/min/mg protein, the Kcat 1.53 s-1, and the Kcat/Km for ATP 13900 M-1s-1 . The corresponding M. smegmatis values were 1.30 μmol/min/mg protein, 0.93 s-1, and 12200 M-1s-1. Therefore, the considerable data available on the structure of the E. coli enzyme should be of direct relevance for ligand binding studies using the mycobacterial enzyme . The M. smegmatis enzyme was also screened with a number of commercially available methionine and purine analogues in order to discover potential inhibitors. 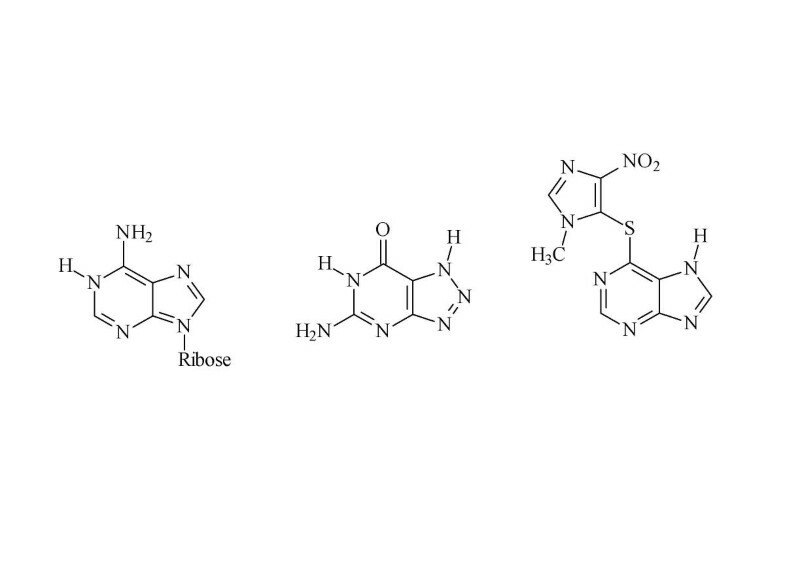 None of the methionine analogues had appreciable activity, while two of the purine analogues, 8-azaguanine and azathioprine (Figure 6), were effective inhibitors. Detailed kinetic characterisation of these inhibitors demonstrated that both acted competitively and both had Ki values around 4 mM. Despite these high Ki values, both compounds inhibited growth of M. smegmatis in vitro, with growth inhibition exceeding 50% down to 2.0 μM. Azathioprine was also able to completely inhibit M. smegmatis growth with an MIC of 500 μM, while the MIC for 8-azaguanine was >1.0 mM. However, both compounds are known to have toxic, carcinogenic, or immunosuppressive properties [34–37], which make them unsuitable as candidate drugs against tuberculosis in vivo. Never the less, these two purine analogues represent a suitable starting point for the design of more effective and tolerable inhibitors of MAT activity. Although the compounds tested in Table 2 are too dissimilar to allow for a detailed structure-activity analysis, one key observation can be obtained. The two most effective inhibitors have no structural alterations in common beyond substitution of the 2-amino position in the purine ring. 8-Aza-2,6-diaminopurine was a much poorer inhibitor than 8-azaguanine, suggesting that the aza-substitution at position 8 was less important for activity. O-Methylguanine, on the other hand, inhibited SAM formation by 60%, highlighting again the substitution in position 2. Azathioprine has a large group substituted in this position, which might be amenable to synthetic alteration for testing novel inhibitors. Azathioprine has been used clinically as an immunosuppressant and anti-arthritic agent, but has not been previously examined as an antimicrobial agent. Further examination of structural analogues may be useful. The structures of 8-azaguanine and azathioprine. From right to left: the adenine portion of ATP, 8-azaguanine, and azathioprine. Given the central role of SAM in cell growth and division, it is unsurprising that MAT has been examined as a molecular target for the development of anticancer agents. Most of the methionine and purine analogues studied have been fairly poor inhibitors. For example, cycloleucine, which is often treated as a classic inhibitor of MAT activity, only has a Ki of 10 mM against human MAT . Similarly, four other cyclic analogues of methionine had Ki values of 0.75–3.0 mM against rat liver MAT . Of thirteen methylmethionine analogues, the best three compounds had Ki values ranging from 0.5–2.4 mM, while most had little inhibitory effect . In terms of methionine analogues, the best inhibitors found to date appear to be a series of epithio and epoxy analogues of the amino acid, where the Ki against rat liver MAT was 7–105 μM . A series ATP-methionine and ATP-homocysteine adducts, which resemble the transition state of the substrates, have also been synthesized and studied [41, 42]. Of these compounds, several had submicromolar Ki values against rat liver MAT. Clearly, with synthetic optimisation, it is possible to generate effective inhibitors of MAT. Methionine adenosyltransferase has been cloned from M. tuberculosis and M. smegmatis. The enzymes have been found to retain all amino acids known from E. coli to be involved in catalysing the formation of S-adenosylmethionine. The M. smegmatis enzyme was functionally expressed, while that from M. tuberculosis was insoluble and inactive under a large variety of conditions. The M. smegmatis MAT has kinetic constants for methionine and ATP that are very similar to previously characterised enzymes, and can be inhibited by 8-azaguanine and azathioprine. The latter compound was also found to inhibit M. smegmatis growth in vitro with an MIC of 500 μM. This finding opens up the potential for the development of more potent inhibitors of mycobacterial MAT. Mycobacterium tuberculosis H37Rv was obtained from Dr. J. Talbot, University of Alberta, and Mycobacterium smegmatis NCTC-8159 (Cornell 3) from the National Culture Type Collection (Central Public Health Laboratory, London, UK). Both organisms were grown in Middlebrook 7H9 liquid medium or on Middlebrook 7H10 agar plates (Sigma Chemical Co.; Oakville, ON, CA) at 37°C. All substrates and inhibitors were obtained from Sigma Chemical Co., Aldrich Chemical Co. (Oakville, ON, CA), or Fluka (Oakville, ON, CA). Genomic DNA was isolated from cells by vortexing packed cells in a minimal volume of 50 mM Tris-HCl pH 8.0/10 mM EDTA/100 mM NaCl containing 500 μm acid washed glass beads (Sigma Chemical Co.). After allowing the glass beads to settle, the supernatant was added to an equal volume of 10 mM Tris-HCl pH 8.0/100 mM NaCl/25 mM EDTA/0.5% w/v sodium dodecyl sulfate/0.1 mg/ml proteinase K and incubated for 1 hr at 37°C with occasional gentle mixing. The mixture was then subjected to extraction with phenol and chloroform:isoamyl alcohol (24:1), and the DNA ethanol precipitated. The nucleotide sequences of the putative MAT genes were obtained by BLAST analysis  of the completed M. tuberculosis H37Rv genome data (, http://www.sanger.ac.uk/Projects/M_tuberculosis) and the incomplete M. smegmatis mc2155 genome data http://www.tigr.org/tdb/mdb/mdbinprogress.html. In both cases, a single high-homology open reading frame was identified and used for the design of oligonucleotide primers. For M. tuberculosis, the 5' primer was GACGACGACAAGATGAGCGAAAAGGGTCGGCTG and the 3' primer GGAACAAGACCCGTCTAGATGGCGCGCTTGAGG, while for M. smegmatis the 5' primer was GACGACGACAAGATGAGCAAAGGTCGCCTGTTTA and the 3' primer GGAACAAGACCCGTTCAGATGGCGGACTTCAGG. Both sets of primers contained a 5' 12 nucleotide LIC (ligation independent cloning, ) sequence and an in-frame start codon, and the 3' primers contained a 13 nucleotide LIC sequence and an in-frame stop codon. The target sequences were amplified from the genomic DNA using Taq polymerase (Promega; Madison, WI, USA), 1.5 mM MgCl2, 200 μM dNTP, and the following program: 1 cycle of 95°C for 1.5 min, 30 cycles of 95°C for 1 min/55°C for 1 min/72°C for 1 min, and 1 cycle of 72°C for 10 min. The amplified target sequence was excised from a 1% agarose gel and the DNA extracted using the QiaexII kit (Qiagen;Mississauga, ON, Canada). The genes were then cloned into pCALnFLAG using the LIC procedure outlined by Stratagene (La Jolla, CA, USA), and then transformed into E. coli XL10 competent cells (Stratagene). The sequence for the M. smegmatis MAT has been deposited with Genbank under the accession number AY254892. The recombinant plasmid was purified from these cells using the QiaSpin miniprep kit (Qiagen), and the presence of the insert confirmed by digestion with NdeI and SacI and electrophoresis on a 1% agarose gel. The plasmid from positive clones was transformed into E. coli BL21 DE3 CodonPlus RIL cells (Stratagene) for functional expression. The BL21 cells containing the recombinant plasmid were grown in LB liquid medium containing 50 μg/ml ampicillin and 50 μg/ml chloramphenicol at 37°C and 250 rpm until the cell density reached an A600nm of 0.6 – 0.8. The culture was then cooled to 28°C and IPTG added to 1.0 mM before 2–5 hr of continued culture at 28°C and 250 rpm. The cells were then pelleted by centrifugation at 3500 × g for 20 min at 4°C, and resuspended in a minimal volume of 10 mM HEPES pH 7.8/150 mM NaCl/1.0 mM DTT/1.0 mM imidazole/2.0 mM CaCl2 before storage at -20°C. The sample was thawed, sonicated on ice, and centrifuged at 3500 × g for 20 min at 4°C. The resulting supernatant was loaded onto a 1.6 × 8.0 cm calmodulin-agarose column (Stratagene) equilibrated with the resuspension buffer. The column was eluted with 10 mM HEPES pH 7.8/1.2 M NaCl/1.0 DTT/3.0 EGTA. The eluted enzyme was concentrated to less than 5.0 ml using a 30 KDa molecular weight cut-off centrifugal filter (Pall Filtron; Mississauga, ON, Canada). The concentrated enzyme was kept at 4°C for short term storage and at -20°C with 20% v/v glycerol for long term storage. The M. tuberculosis MAT was also subcloned into pET43.1a (Stratagene) for expression as an E. coli NusA fusion protein. In addition to expression in E. coli BL21 DE3 RIL, the pCALnFlag and pET43.1a constructs were also expressed in E. coli BL21 DE3 pLysS (Stratagene), E. coli Rosetta DE3 pLysS (Novagen, Madison, WI, USA), or E. coli Origami DE3 pLysS (Novagen). Solubilisation and refolding of inclusion bodies was attempted using the Novagen protein refolding kit as per manufacturer's instructions. Protein concentration was determined using the Bio-Rad dye (Mississauga, ON, Canada). Protein samples were examined by electrophoresis on 10% SDS polyacrylamide gels followed by Coomassie R250 staining. MAT activity was determined by incubating 10 μl of enzyme source with 100 μl of 100 mM Tris-HCl pH 8.2/20 mM MgCl2/150 mM KCl/10 mM ATP/5 mM dithiothreitol/5 mM L-methionine for various lengths of time at 37°C. The production of S-adenosylmethionine was then quantified by an HPLC method based on that of Yarlett and Bacchi . 100 μl of 0.1 M NaH2PO4 pH 2.65/8 mM heptane sulfonate/2% v/v CH3CN (Buffer A) was added to the incubation mixture before the injection of 10 μl onto a 4.6 × 250 mm Econosphere C18 column (Alltech; Deerfield, IL, USA). The column was eluted with a 30 min gradient from 85% Buffer A and 15% Buffer B (0.15 M Na2HPO4 pH 3.25/8 mM heptane sulfonate/26% v/v CH3CN) to 100% Buffer B. The flow rate was 1.0 ml/min, and the reaction product was detected by ultraviolet spectrophotometry at 260 nm. All separations were performed on an Agilent 1100 HPLC equipped with an autosampler, variable wavelength ultraviolet/visible spectrophotometric detector, and Chemstation operating system. For determining the kinetic constants for MAT, the enzyme was incubated as above with 0–4 mM substrate, 10 mM cosubstrate, 20 mM Mg2+, and 150 mM K+. The constants were determined by non-linear least-squared curve fitting using the Michaelis-Menton equation in the Scientist program (Micromath; Salt Lake City, UT, USA). For initial inhibitor screening, enzyme was incubated with 1 mM substrate, 10 mM cosubstrate, 20 mM Mg2+, 150 mM K+, and 10 mM inhibitor as described above. Compounds which yielded greater than 70% inhibition of SAM production were rescreened using 0–10 mM inhibitor, 10 mM methionine, 0.5, 1.0, 2.0, or 3.0 mM ATP, 20 mM Mg2+, and 150 mM K+. The resulting data was examined using Dixon or Cornish-Bowden plots for competitive or uncompetitive inhibition respectively . Test compounds were serially diluted in a microtitre plate to yield 2.0 mM – 976 nM in a volume of 100 μl. A culture of M. smegmatis in mid-logarithmic growth was diluted in Middlebrook 7H9 medium to yield 2 × 105 cfu/ml. 100 μl of this diluted culture was then added to each well containing the test compounds before incubation at 30°C for 72 hr. Wells containing drug alone or bacteria alone were included as positive and negative controls. Microbial growth was measured using a 96-well spectrophotometer (Molecular Devices; Sunnyvale, CA, USA) at 650 nm. The MIC was determined as the lowest dilution which completely prevented microbial growth. 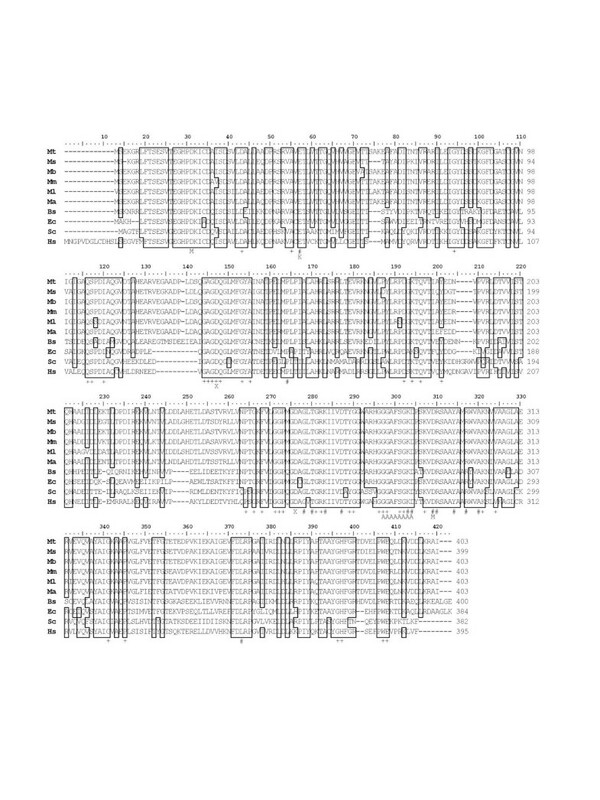 Additional MAT sequences were obtained from GenBank and the incomplete M. avium http://www.tigr.org/tdb/mdb/mdbinprogress.html, M. bovis http://www.sanger.ac.uk/Projects/M_bovis, and M. marinum http://www.sanger.ac.uk/Projects/M_marinum databases. All sequences were aligned using the Clustal algorithm and the BLOSUM sequence substitution table in the ClustalX program . Aligned sequences were visualised with the Bioedit program . The aligned sequences were then used with the ProtDist component of Phylip  to construct a distance matrix which was the basis for tree construction using neighbor-joining . All trees were visualised using Treeview . The authors would like to acknowledge the technical assistance of Cynthia Radford with Bacillus megaterium expression. This work was funded in part by a Technology Innovation Fund Award from Defence R&D Canada to BJB. Preliminary genome data was made available from The Institute for Genomic Research http://www.tigr.org for Mycobacterium smegmatis (funding by NIAID) and M. avium (funding by NIAID), and also from The Sanger Centre http://www.sanger.ac.uk for M. bovis (funding by Beowulf Genomics and MAFF) and M. marinum (funding by Beowulf Genomics). BJB conceived the study, and performed the cloning, expression, and phylogenetic analysis. MHK performed the enzyme assays and inhibition studies.